Newark, NJ – April 20, 2011 - Mayor Cory A.Booker, Lt. Governor Kim Guadagno, Panasonic Corporation of North America Chairman & CEO Joseph M. Taylor, Deputy Mayorfor Economic and Housing Development Stefan Pryor, Members of the Newark Municipal Council and other dignitaries announced that a lease agreement will bring Panasonic Corporation of North America Headquarters to Newark, NJ in 2013 to a new, state-of-the-art, sustainable high-rise office building to be constructed adjacent to Newark’s One Riverfront Center. The structure will be home to 1,000 of the corporation’s employees and contractors beginning in 2013. Panasonic is currently located in Secaucus, New Jersey. At the press conference, theparties to the agreement signed the lease, and Mr. Taylor pinned eco-pins on Mayor Booker and Lieutenant Governor Guadagno, symbolizing Panasonic’s and Newark’s joint commitment to green building andgreen practices. The proceedings were broadcast live over high-definition video conference to 60 Employee Advocates at Panasonic who will spread the word toother employees and ensure a smooth transition to Newark for Panasonic personnel. “Panasonic could have gone anywhere on this continent,but they elected to stay in New Jersey and to relocate to the state’s largest city. That is a win for both the state and Newark. Additionally, Panasonic’s decision to come to Newark is a significant milestone in thecity’s continuing revitalization,” said Lieutenant Governor Kim Guadagno. The Lieutenant Governor unveiled a video of Governor Christie, who offered congratulations. 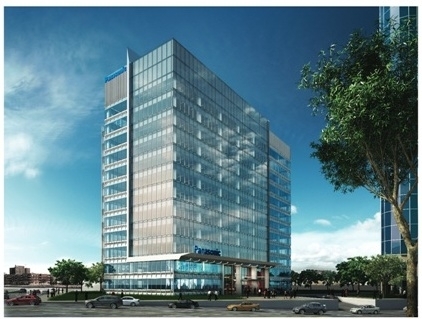 "Asa long-time investor in Newark, Matrix is extremely pleased to further our commitment to the vitality of this great City in realizing this property's development into a state-of-the-art office building and significant economic catalyst," stated Donald Epstein, Executive Vice President of Matrix Development Group, owner and developer of Riverfront Center in Newark, which includes the existing One Riverfront Center, also known as the Legal Center, Two Riverfront Center, and 5-acres of additional land for development. "We are proud to welcome Panasonic to this location, and are confident that the company will benefit from the tremendous access to transportation and numerous area amenities this site affords," Epstein added. "SJP Properties is committed to creating environmentally responsible developments that adhere to the highest standards of excellence and this building, with its advanced technological and energy efficiency features, is a continuation of thatmission," stated Steven J. Pozycki, CEO of SJP Properties, which is partnering with Matrix on the development of Two Riverfront Center. "Weare extremely proud to be part of this significant project, which will contribute to New Jersey's State Plan of redeveloping our cities, and we look forward to delivering a world-class, modern office building for Panasonic's US headquarters that will support the company's business objectives."